Here's some cool news: we're working with Super7 to bring out a kickass new victim! This guy is cast in translucent orange resin with random black drips all over his poor body, with gold spray on his limbs and face, and glowy eyes! 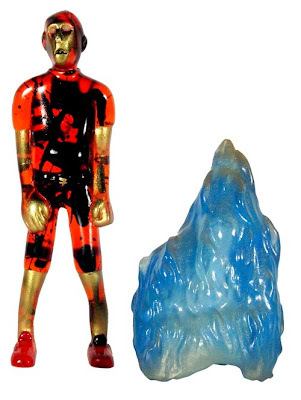 His clear pearly-turquoise flame fits snug on his body and has a gold spray accent as well. This guy drops on Feb 7, so mark your calendars!